At the TTC public consultation on January 24, officials strongly denied the claim in the Globe and Mail story quoted below that service cuts would result in job losses at the TTC. The article was modified slightly overnight removing the reference to follow-on cuts from lost riding on routes that would remain. The bulk of the additional staffing is at the Toronto Transit Commission, which is adding 376 jobs for capital projects such as a major rebuild of the bus fleet, and 221 jobs for operations, including more drivers to accommodate skyrocketing ridership. That number will go up if Mr. Ford can’t persuade council to reduce hours on 48 little-used bus routes, a proposal that is supposed to save the equivalent of 87 drivers’ positions. TTC management continues to plan for service increases addressing growing demand on the system in fall 2011. Many attending the TTC’s consultation meeting were annoyed at the format where TTC staff approached the issue as one where people needed to be told what their alternative routes for travel might be. The opportunity for concerted public outrage was, by this tactic, short-circuited — good for the staff and politicians, but less than satisfying for TTC riders who wanted to demand answers, not be placated. The displays of each affected route showed the numbers of riders affected by each change, but notably they did not show the riders/vehicle hour values which, in some cases, crests the 15/hour screenline the TTC arbitrarily chose for this exercise. Moreover, maps of overlapping routes were distant from each other so that the combined effect of removing several lines was not immediately obvious. Later in the evening, I appeared on Goldhawk Live to discuss the proposed cuts. Former TTC Vice-Chair Joe Mihevc was also on the show, but nobody from the current TTC Commission would come on the program. Only three of the Commissioners were at the Metro Hall meeting. As for the other six, they were, one assumes, too busy to appear on this popular public affairs program. Kelly Grant reports in the Globe & Mail about the staffing effects of the TTC’s budget. The bulk of the staff increase for day-to-day operations come from the TTC, which proposes adding 221 total positions at a cost of just over $20-million, most for extra drivers to accommodate skyrocketing ridership. The transit agency expects to axe 116 drivers jobs by shrinking hours on 48 little-used bus routes – 87 jobs for the route reductions and the equivalent of 29 jobs to reflect presumed decreased ridership on surviving hours on those lines – but it proposes adding 337 positions. Of the additional jobs, 252 are operators, 41 are for training, technology and maintenance and 35 are for station managers and other customer-service enhancements. The 221 positions mentioned above were listed in the presentation to the Commission of the TTC’s Operating Budget (table, page 8). This is the net change in approved staffing, and it includes many operators for extra services. There is no reference to the 116 positions, and this would, in any event, be a temporary situation if the equivalent service were to be restored elsewhere in the system in the fall. The interesting part is the reference to presumed decrease in riding on the affected routes during “surviving hours”. This confirms that the TTC acknowledges that when service is cut for part of the day, it can affect riding at other times. Moreover, this implies that service at these times might be cut if riding drops enough. This is precisely how the death spiral of a transit system begins. We can pretend that it doesn’t matter because the affected routes are small and unimportant, and most of the cuts are late on Sundays when we should all be home in bed. The real world doesn’t work that way. A detailed review of each proposed cut has been added to this post as a separate file. If cuts are to be made, some are more obvious candidates than others. Although the TTC claims that all of the proposals received careful evaluation, I find this hard to believe, and some of these definitely need review. There are also cases where route and/or schedule restructuring may improve the situation without disservicing riders. This is the sort of analysis one would expect from the TTC, but which the haste and political pressure of the moment have prevented. This morning, I was on CBC’s Metro Morning talking about the proposed cuts to many routes, and this interview was followed by one with TTC Chair Karen Stintz. The podcast is now available online (11:15 am). I talked about the TTC balancing its budget with service cuts and asked what they would do in 2012, but oddly enough Stintz replied that the cuts are not a budgetary tactic. They are a reinvestment of resources where ridership actually is. Two years after their implementation, the new services have not proved themselves, and the money is going elsewhere. Riders will have, generally, a five minute walk to a nearby route. This is all very well, but if we start talking about increasing walks for riders in areas with low demand and infrequent service, we will see the network gradually disappear. Also, just because another route is five minutes away doesn’t mean that it is actually useful to a would-be rider. The TTC has estimated that it will lose only one in five of the existing users of the services that would disappear, on average, although the percentages vary considerably from a low of 8% to a high of 62%. Going in to the studio, I took the 5:15 King car from Broadview Station, and over the trip south and west to John Street, it handled 19 passengers, me included. The peak load on the car was 12. I am quite sure someone might suggest that a car every 15 minute is excessive and the TTC could make do with less service to be “more efficient”. However, if that car ran every half hour, I wouldn’t bother waiting for it unless I was really a captive rider. That’s the problem with “efficiency”: it’s easy to point to a half-empty bus or streetcar and say “get rid of it”, but that’s the path to dismal transit service, “service” in name only. This year, we will cut 20% of the bus service on Sundays after 10 pm. What’s next? If Chair Stintz wants to do something really useful, she can start a public discussion about what constitutes good service. How often should vehicles arrive at stops? How full should they be? Should we demand that long routes have more riders to balance off the cost of the longer trips they take? Should we cancel little-used express buses (even if they are a Commissioner’s pet project) so that their resources can be allocated elsewhere? Should unused subway stations close unless they generate enough traffic? As we head into a very difficult year for the City’s budget and transit subsidies, the important question is what service we should have. Once that is answered, we can find ways to pay for that service. Reluctantly, we may accept less than perfection, but will know what our goal is and what we traded off for tax cuts or subsidies elsewhere. The TTC will conduct four public meetings on the proposed service cuts on January 24-27 at various locations around the city. These will be set up as “information sessions” with displays, roving staff and politicians with “Ask Me” stickers, but there will be no formal presentation nor an opportunity for members of the public to make deputations or presentations that would be heard by others present. When the idea of public consultation was floated at the recent TTC meeting, the clear intent was to go out and explain, patiently, to the great unwashed public that there was a good and valid reason behind them losing their bus routes. The idea is to massage public opinion, not to make substantive changes in policy. After all, there is a mandate to cut unproductive services and save taxpayer dollars, and why should anyone care about the long walk you will face getting to transit? Unlike most of the people who will attend these meetings, I have a platform. If I were going to make a presentation, here’s what I would say. In a previous article, I detailed the service cuts using the TTC’s own published information. These cuts were supposed to be based on ridership per vehicle hour, but many of the cuts violate the TTC’s brand-new standard of 15 riders/hour. The most outrageous of these cuts is the Downview Park 101 bus on Saturdays, and this proposal reveals an unpublished part of the “logic” behind the cuts. The TTC worries about “consistency” in service provision. Back in the days before the Ridership Growth Strategy brought 19-hour/day service almost everywhere, a route had to qualify for service on weekdays before it got service on weekends. Never mind if the demand is greater on weekends, if a route doesn’t generate enough traffic for weekdays, it’s toast. The Downsview Park bus carries only 4.1 passengers per vehicle hour weekdays from 6 am to 7 pm, although this number is 7.0 per vehicle hour if we only look at 9 am to 3 pm. Weekday evenings, from 7 to 10 pm, the number rises to 9.3. Saturdays, the numbers are higher than the screenline of 15 (with 89.0/hour in the early evening! ), but according to TTC logic, providing service at that time, but not on weekdays, might be confusing. I am not making this up. Several other routes have this sort of problem, but the 101 is the worst example. This has been spun politically as something the TTC missed. No, it wasn’t. It was a victim of the blind application of a formula without even the decency to flag a potential problem. Why Must I Lose My Bus? The TTC claims that the $7-million to be saved with the service cuts will be reallocated to service elsewhere. 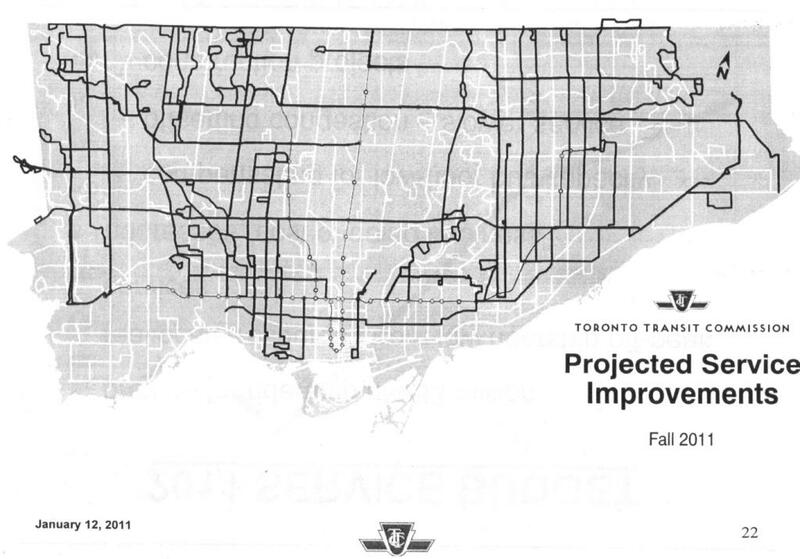 The budget presentation includes a map showing routes on which service will be improved in Fall 2011, and the TTC claimed that this would be financed from the late-night cuts. However, it turns out that service improvements effective January 2011 are also paid for from this money, and the map may actually include many routes where the added service for 2011, such as it may be, is already in place. Of the $7-million, $4-million is already spoken for. This tradeoff happened without any public input or discussion by the Commission or Council, even though at the TTC budget meeting, the clear implication was that we faced a spring service cut that would be offset by a fall service improvement. By the time the operating budget reached the City’s Budget Committee, the Budget Analyst’s notes showed the $7-million as a saving, not as a reallocation. When this was pointed out to TTC management, there was hurried shuffling and claims that the money was really there, somewhere, but it’s not obvious to anyone reading the presentation. Either it’s a saving (read “cut”) or it’s a transfer, in which case the change should net out to zero. If the January improvements were to be paid for from these cuts, why was the TTC unable to say this at its budget meeting? Instead they claimed that they would publish the definitive list in June. Why didn’t the TTC put the best face possible on things by showing services they had already improved in anticipation of savings from the service cut? Was Ridership Growth Strategy a Failure? The TTC crows on every possible occasion about record high riding even in the face of fare increases and crowding. They point to the Ridership Growth Strategy, the basic idea that providing better service will attract riders, as their formula for success. Now we learn that part of this strategy, the addition of full service on almost all routes, did not work out as planned. The TTC does nobody any favours, least of all those who try to support transit programs, with their half-baked presentations. Yes, many routes don’t make the 15 rides/hour threshold, but that has never been a TTC Service Standard. Indeed, the standards have not been re-examined for years and the full-service policy more or less eliminated the need for much of the fine-grained route reviews. Now that we’re back nibbling away at the network, there has been no discussion about what criteria should be used to evaluate service. After a lot of tedious work, I produced a chart attempting to show the relationship between Ridership Growth Strategy service improvements, and the cuts proposed for 2011. This is a busy sheet, and my apologies, but there’s a lot of info to pack into this. There may be a few errors, but it’s the overall view that is important. All services that were added or improved in November 2008 by RGS are listed here. If they are not affected by the 2011 proposal, they are in black. If they are affected, they are in red. Also shown are cuts of services that already existed before the RGS improvements took effect. What is important about this chart is that many of the services improved or added through RGS remain in operation. Those who prefer to think that everything done in the ancien régime was a complete waste of money would do well to recognize how much RGS contributed to the system. The challenge now is that the cuts start to eat away at the edges — most of the effect is late at night on weekends, and on Sunday late evenings about 20% of the buses in service disappear. What will the TTC do for an encore next year? How many other services will be affected? What is the effect of a higher threshold for a service to be viable in the dwindling TTC budget? Will the TTC undertake a full discussion of service options? Will riders on the premium express services be subject to the same close scrutiny, especially if, as proposed, the TTC changes these routes to regular fare operations? What will be the criteria for adding new services, or for restoring service where it has been cut? Will the loading criteria be relaxed to pack in more riders without adding service? Will the TTC even bother to report publicly on the condition of its service? This exercise — pitting the users of lightly used routes against those who can’t even get on their bus — is an easy political ploy. However, you can only get rid of the handful of routes like Lawrence-Donway and Silver Hills once. You might even weather a goof like the Downview Park bus fiasco where not only is there demand the TTC failed to acknowledge, but also a multi-billion dollar project now underway that will replace this bus with a subway station. But when more and more people can’t get on their bus or streetcar, when people complain that there is no service and huge, unpredictable gaps between what remains, all of those “savings” will be small change. Toronto politicians are happy to float schemes for expensive rapid transit networks while counting the paper clips when it comes to ordinary bus service. Ah, but that’s the Capital Budget, you say, and that doesn’t count. Sorry, folks, but as you may have heard from various media and hand-wringing politicians, Toronto has a debt problem, one that will stifle any growth and even basic maintenance needs at the TTC in the very near future. Either Toronto gets more subsidy, or it raises taxes to carry a greater debt load, or the TTC will fall apart in very short order. We are “house poor”, carrying a huge mortgage we can barely afford, and surviving on beans and wieners until times, if ever, are better. That’s what capital spending does. Indeed, the “stimulus” program of the past two years triggered a borrowing requirement of hundreds of millions by the City to pay its 1/3 share of the program. We may get Queen’s Park back to the table for a big transit plan, and we may even talk Ottawa into the game too, but Toronto will be on the hook for something, and we must be prepared to pay our share. The debt will drive up interest payments, and there will be less money available for transit operating subsidies. That’s how an unaffordable subway network destroys your bus service. Toronto is extraordinarily ill-served by politicians who talk a something-for-nothing game, who presume that money will appear to fund transit services and construction. Yes, we can have a tax freeze and a fare freeze, but when you’re standing in the cold looking down the road for that bus, thinking about a taxi or a new car, remember all that money those freezes saved you. This could be even worse than the dark days of the mid-90’s. Will there even be a system left to save? Steve: Some of this is sabre-rattling for the coming election, but neither Queen’s Park nor Ottawa seem willing to bite on this. They are tired of Toronto always wanting more and creating new, expensive projects faster than they get funding for old ones. The TTC must take the lion’s share of the blame here for the absurd way in which it costs and presents its budgets. Great question Steve…. it’s all very well establishing criteria to remove service – but no-one ever brings up criteria to add service where there was none. The TTC does have criteria for increasing service (which is good), but no objective measure for extending hours of service. Steve: I also think that they have overestimated the number of people who will continue to use transit, and have ignored the effect of losing the other half of a round trip because the late night service isn’t there any more. 1) How can you claim that you need a subsidy when you have just wiped out one tax-the Vehicle Registration Fee, foregone a property tax increase (in line with inflation) and nixed a proposed fare increase? For example, the federal and provincial governments collect gas taxes in excess of the normal sales tax amounts but where does this money go? If they gave municipalities an equitable share of this money-based on the fact that cities, regions and counties are responsible for a considerable amount of our roadways -that would relieve some of the burden from property taxes. That money would then be available for other uses. Steve: Actually we do get some of the gas tax from both levels of government, but it does not come close to paying even half of the ongoing capital costs, and nothing on the operating side. However, on the subject of affordability: Advocates of essential service legislation want a clause included that would require an arbitrator to consider the “ability to pay” for an employer. What they forget is that when the City and TTC choose not to raise fares or taxes, that’s an “unwillingness to pay”, not an “inability”. I think crowding is something that happens on every transport system at peak times. While record riding might be true, it is also true that the City of Toronto’s population has increased over time, so we would expect an increase in riders even if the TTC sat on their hands and did nothing. So I think per capita ridership is a better measure here, and when measured on that basis, is still lower than what it was historically. Yep. It’s the ordinary bus that pulls up to the ordinary bus stop that will always be how people access the system. Of course, if you cut the feeder buses, crowding on the trunk line would be expected to reduce … but that is a perverse way to reduce crowding. To use an analogy, it doesn’t seem to make a great deal of sense to “build extensions on the house” when there is a struggle to “keep the lights on”. Unless the TTC wants to take the MTR Hong Kong approach and build malls and development around its stations and use property holdings to generate supplementary income… but seems unlikely. I don’t know what the answer, or alternatives are, but it doesn’t look pretty. Steve: And of course MTR has all that land around its stations to develop in the first place. Cities are not allowed to assemble land in Ontario for the purpose of redevelopment, and even if they did, the land wouldn’t be free. The #101 bus situation looks really odd. One would think that routes whose ridership is higher on weekends than on weekdays are very good for TTC’s finances. They can use the same bus on one of such routes on weekends, and on a busy major route on weekdays, thus earning more fares on the same capital investment (cost of the bus). This could have been hidden by the fact that the 92 had extended service hours in the summer and perhaps even the early fall — it didn’t appear as an increase, but the cancellation of an annually planned decrease. Is RGS a failure? My opinion: far from it. When a lot of these improvements are being retained by the TTC, then I consider it to be some form of success. Who would have imagined that several, normally limited service, routes would be able to retain extended service because demand swelled to that point? I didn’t, and I’m sure that other people didn’t either. If the beef is that there isn’t enough funding for Transit Operations, one must ask why this is the case? My take (and allow me to be quite offensive here) is on how the TTC spends any extra monies it gets from governments, local, provincial, and federal. The perception here is that any extra money that goes into transit operations does not have any effect on service. In fact, my feeling is that they believe that the money is spent foolishly, either through poor planning or (dare I say it) bloated union contracts. This latter statement is what people see when they see scenes of people doing a poor job of customer service on the front lines. Anyone who has heard my stories of offensive TTC employees (and I have a lot of them) will wonder how much these guys get paid. In other words, no one wants to be on the wrong end when there are reports of low customer service from the TTC and a salary increase for TTC union workers in the same sentence. Again, dare I ask: what are we paying these guys for when we get so little in return? There is no political entity (other than the NDP) who is willing to touch this political hot potato. Steve: The TTC is perfectly capable of wasting money without unions being blamed for everything. Just look at management’s desire to spend $1-billion on platform edge doors throughout the system for starters. However, not only does the TTC already have landholdings for redevelopment (see Eglinton Bus Depot/Garage), which it/The City have sorely neglected (after spending millions to move the bus platforms several years ago); it does have other opportunties as well. Steve: In fact, the TTC and City were seeking development proposals for the Eglinton terminal lands, and that was put on hold when the Eglinton LRT subway came onto the table. That site is needed as a staging area for the substantial work needed to build the junction between the Eglinton and Yonge lines. Construction would be much more difficult if there was a brand new building in the way. The City not only CAN but HAS assembled land for redevelopment, that would be 10 Dundas East/Metropolis/Toronto Life Square, which along with Dundas Square was all expropriated, and the north-side building is certainly not a library or a park or a rec. centre, it is offices and a mall. Whatever political/legislative language was used, the City was the defacto developer, and could surely do the same around any other subway station if it so chose. Steve: That is only possible with willing landowners. By contrast, the hotel at Gould that just burned down would have been a prime candidate for a land assembly, but it stayed stubbornly in private hands. Were the City more pro-active on this file; and assuming the TTC was paid a dividend from the proceeds for such development, it would likely net them anywhere from 10-20M per year based on existing sites (adjusted already for costs for altering stations); were they actually prepared to redevelop adjacent lands or existing private-sector lands over top of stations; this number could be considerably higher. That would not begin to fund expansion or SOGR for that matter; but it would make a nice contribution to the operating (service) budget. Steve: Assuming you could actually get 10-20M per year, net, that would generate less than the cost of one kilometre of subway tunnel over a decade. One other factor in development over the subway is the cost to do so. As long as there is cheaper, unencumbered land to be had, where developers can build, make their money, and get out before the market shifts, they will go there first. Subway lands require a lot more money and a lot more time to design and build, and this carries risk that developers tend to avoid as long as there is lower-hanging fruit still available elsewhere. Toronto may be comparable to Hong Kong in a hundred years, but not now. The public meeting notice implied that the meeting would allow the public to comment (i.e. complain) because it said that those unable to attend could fill out the standard TTC complaint/suggestion form. Your posting leaves the impression that the public won’t have an opportunity to complain or that it won’t be effective. Steve: The distinction I am making is between a meeting where people get to talk and ask questions as a group, holding the politicians’ and staff’s feet to the fire, as opposed to just milling about. The result is that there isn’t as strong an exchange of ideas and questions as might otherwise occur. As for submissions online, unless the TTC actually publishes them we won’t know either what was said, or what answers (reasonable or not) may have been offered. All of this is a way to manage “consultation” to minimize the effect and strength of public input. For example, there is nothing on the TTC website page advertising the meetings to give any further information about what is being done beyond the list of cuts. You can get far more info on my site, but of course the TTC doesn’t link here, and I may be just a teensy bit biased against their proposals. Peak hour patronage is already a saturated market. The bigger gains, in my humble opinion, are to be made in the off peak on weekends and evenings, when vehicles are in surplus and are idle in depots not making money or collecting fares. There does seem to be a market for development around TTC subway stations with all the high-rises and condos already in the immediate vicinity of many stations, and that money is being captured by private investors, not the TTC. Sounds more like an announcement with Q&A rather than a consultation or meeting. Sounds like a tactic to defuse opposition. But…hey….we could have an NFL team. Steve, question for you. Are there any service cuts that you are/would be able to support, given the information that you have? I know, of course, that service cuts are never a desirable thing when you are trying to build ridership at all times of the day and week. However, if TTC can’t/won’t raise fares, and the city won’t provide enough subsidy to cover the service additions, are there more justified service cuts available than what are currently being proposed? Or do you think the money should be found some other way? Steve: There is a handful of routes in the TTC’s list that may be candidates for cuts either because they serve areas where there is absolutely no demand, or because they are sufficiently close to other services, or where a judicious route amalgamation would reduce costs while retaining service. This might save a tiny part of the overall claimed savings. It’s a one-time fix, and it won’t come close to paying for the backlog of service improvements increased riding will bring. The real fight here is to demand that the TTC and Council explain what they will do the next time the TTC needs to find some money, including the $8-million in “unspecified reduction” they are going to dig up to offset the lack of a fare increase. This sort of half-baked analysis gives the impression that there is “efficiency” to be squeezed out of the TTC whenever someone needs to balance the books. What routes will be “inefficient” in 2012? 2013? When you consider that TTC staff didn’t even want to publish the numbers that “justified” the proposed cuts, and that we would never have known how flawed their analysis was if this had been allowed, you have to wonder just how transparent budget and service planning will be in coming years. I am NOT going to give a full response to you. All I will say is that your arms must be tired from your continual beating of the anti-unionism drum that your extreme right-wing ideology demands that you do. It is interesting that EVERY experience you have on the TTC is an absolute disaster that has been totally ruined by an ATU113 member! Perhaps, instead of pointing a finger at the ATU113 membership, you should look at where the other three fingers are pointed! I personally feel that you go onto the TTC with a chip on your shoulder and look for things to blame on the union. Your comment about “bloated union contracts” is a reflection of your political leanings; you (in my opinion) have no idea why the various items are in our contract. Until you have worked under our working conditions, you have no right to comment on the hows and whys of our contract. As for your resentment about TTC employees being paid more than a computer programmer, all I have to say is that we all make choices in life and if you chose a certain career path — don’t take your resentment and envy out on those who chose a different career path! Will the service cut to #105 (Dufferin N.)pose a problem for nannies returning home or starting work late on Sun. or holidays? Why is this the only route in York picked? Does not York Region pay TTC about $125/hr to supply service N. of Steeles? This would mean that cut is subject to Vaughan’s/Regional council’s decision, right? Steve: I have already pointed out in another reply that the period being cut is one where there is no service north of Steeles already. TTC farebox ratio is 70%. Squeeze any more and you will be asking it to turn profits! Just cutting and cutting is not sustainable. The cheapest transit system is no transit system at all. Steve: I normally support your positions on transit matters but I must say that I have some sympathy with the SUPPOSED policy the TTC has on cutting lesser-used routes or frequencies so they can move resources to overcrowded ones. Resources are limited and it does make sense to me to evaluate routes and frequencies as demand changes (or fails to materialise) and then move resources from lesser used routes or times. If every cut or reduction becomes an example of “cutting into muscle” then the TTC will never try a new route or an expansion of service unless success (as they measure it) is assured. As your chart shows, many of the fairly recent RGS expansions have got pretty decent ridership, and are NOT being cut. This does, of course, mean that the metrics the TTC use to measure ridership need to be clear and verifiable. I have very little confidence in their figures (or how they read them.) It is also unclear to me how reducing bus service late on Sunday nights will provide either extra drivers or buses during rush hours; if I understand correctly, the TTC already puts out every available vehicle. Steve: See my detailed route-by-route comments just added to the article. I have big problems with the gaping holes in what passes for “analysis” of some service changes especially when this is done on a rushed, politically inspired basis. There are arithmetic errors and instances where the TTC’s own stats show that a service meets the grade for retention. That said, a number of late night services, mainly on Sunday, don’t do very well. However, this is a one-time saving, and the question next year will be “what’s next?”. I can foresee all sorts of cutbacks in the “room for one more on the roof” methodology, and this must be debated in detail in public well before we find ourselves at a last minute decision. Even the 15 riders/vehicle hour “standard” has never been before the Commission or public for discussion along with an indication of just what it (and other possibly levels of this criterion) would do to the system. As I said on CBC this morning, the King car I rode to the studio on would not have been overcrowded on a half-hour headway, assuming you could get riders to bother waiting for it. That’s the danger of cuts like this. “The TTC worries about “consistency” in service provision. Back in the days before the Ridership Growth Strategy brought 19-hour/day service almost everywhere, a route had to qualify for service on weekdays before it got service on weekends. Never mind if the demand is greater on weekends, if a route doesn’t generate enough traffic for weekdays, it’s toast. If this is the case then how does the TTC justify the summer only service for the Davisville bus to the Don Brickyard? Id there a double standard here where some ares are more worthy of exceptions that others or has the TTC forgotten that Davisville is now basically a rush hour short turn of Bayview? Looking at the hand-written changes to the budget papers, I assumed that it was clear where this was coming from. Generally they get about $2 of revenue per rider. The hand-written changes showed an increase in riders by 4 million, which presumably would provide an extra $8 million of revenue. I’m not sure why no one made a corresponding change to the revenue – perhaps there was no time. Perhaps the extra $16 million was won by some internal deal where TTC would find an extra $8 million … and no one wanted the mayor’s office to see that they knew exactly where the $8 million could be found so easily … and that cancelling the 10¢ fare hike only required an additional $16 million subsidy, rather than $24 million (because the other $8 million comes from the increased ridership). In reality then, the $8 million comes from the usual TTC technique to save a bit of money – not increasing service to match the increased ridership. Though I’m only reading between the hand-written lines here. On the topic of efficiency in transit operation that you wrote about in today`s update, I will give you a real life example. My current work has me operating on route 16 McCowan in the mornings. I take the bus out of Birchmount Garage at 5:48 am and go into service northbound from Warden Stn at 5:56 am. On this particular trip, I will give a brief snapshot of a typical trip. There is usually 1 person at Warden Stn. and 2 or 3 at Birchmount and St. Clair. One of the Birchmount & St. Clair passengers exits at Danforth Rd & St. Clair with another one exiting at Midland & Danforth. 1 or 2 people board at Midland with one exiting at Eglinton. There are sometimes 1 or 2 people boarding at Eglinton. After Eglinton, I pickup around 5 or 6 people. At Lawrence Ave most of the passengers on board exit the bus, leaving 2 or 3 passengers. From Lawrence northound, I will usually have another 5 or 6 people board. There will be a fairly large exit at Ellesmere with about half the load remaining on board for the trip into Scarborough Centre. If one were to actually crunch these numbers, I think that they could make the argument that this trip is less than efficient. However, for this group of passengers (who tend to be regular riders) this trip is important for them to get to work on time. I experienced a mechanical problem a couple of weeks ago as I was getting ready to leave the garage and missed this trip as a result (being placed into service southbound at Lawrence for the return trip). The regulars were asking me what had happened the next morning. My trip is important as I am the first am extra to go into service northbound, thereby cutting the headway from 15 minutes to 8 minutes. I never have a full bus on this trip, but it is important for the passengers that rely on it. If packing them in means efficiencies, these are the services that will be cut in the next round in 2012. Steve: This echoes my observations about the 5:15 King car from Broadview Station (the second trip of the day). Lots of ons and offs with peak load well under the total boarding count. Missing a car that runs every 15 minutes is a difficulty, but missing one that comes every half hour is a disaster. “Efficiency” has to include the rider’s time and convenience because that convenience is part of what we are selling for their fare. If we treated the subway the same way, there would be trains every 15 minutes, and one line might close on weekends. Your analysis of route cuts is depressing, and makes me wonder just how well-versed our transit planners really are. From the “amateur” point of view, it does seem that glaring holes in service areas exist even before these eliminations will occur. For example, and I am no expert here as I have said, but even with, for example, the 61 AVENUE RD NORTH bus operating, the two quadrants north and south of Lawrence Ave, from Wilson to Lawrence, and Lawrence to Eglinton, between Yonge and Bathurst, is a huge area to expect people to walk to the nearest stop. Is it because it is assumed the people who live there don’t need public transit? Steve: The TTC claims that it checked for the creating of gaps in the network, but it doesn’t take long to find that they didn’t look very hard. Similarly, I have always wondered why 56 Leaside service couldn’t be rerouted off Eglinton proper, by extending it north on Laird to Broadway and running it over to Yonge St. that way (traffic circles be damned). That would make it also a bone fide Leaside service! I’m sure explanations exist, other than the ridiculous “body-counts”: I thought public transit was a service. Do we limit the operation of fire or police or ambulance personnel because there is not enough call for them in certain neighborhoods? Steve: I don’t think the folks living on Broadway (sans traffic circles) would be too happy about gaining a bus route. It’s a narrow residential street. No narrower, and far straighter, than what the 82 ROSEDALE bus operates on. In fact, a lot of North American cities operate 40 and 60 foot buses on similar streets. Steve: But much of the Rosedale bus operates in one direction only, and it’s been there for years, and there is no nearby way to get transit service. The locals are used to it. There again is the problem (apart from people not wanting big buses on their street): the TTC is not amenable to altering service for requirements. It wants it the other way around. And you prove that point by noting that a slight service adjustment to 32 EGLINTON WEST to operate both ways along Emmett instead of through the park(!) at Jane and Eglinton would mildly inconvenience some people. Well, this sort of diversion is commonplace in most other cities (and indeed on some other TTC routes, altbeit less-travelled, e.g. 30 LAMBTON at Islington). Community transit does not really seem to apply to the TTC. Again, I’m wondering just how much extra the Sheppard stubway is costing the system? Really, isn’t it, and the Spadina line, underperforming for riders and revenue? I’ve just tried doing a bit of searching on the TTC site for the cost/ridership/revenue info, but I’m less able to be a computer/search whiz, and I suspect that info would be buried as deep as some tunnels – it just might be a bit embarassing. Because what are the odds that we should close the stubway for some bus service instead, and reapply those good savings (likely in the millions) towards averting these cuts. Steve: Even when the TTC published this sort of info, flawed though it was, they treated the entire subway as one route. I will mention one thing, and I have been deliberately withholding that fact for several years now: I travel with a sidebag which has the logo of the Conservative party. Elements within the TTC need to learn that regardless of political affiliation, everyone has a right to a pleasant experience on the TTC. I don’t go about brandishing the bag (unless I need to obtain my day pass where I usually keep it), and I do not go about mocking TTC employees every time I get on board. I simply get on, silently pay my fare, and move about within the TTC vehicle without much drama. The Taste of the Danforth incident? Had my bag. When I was kicked off a streetcar with my pregnant wife? Had my bag. Getting an earful after asking questions about if this Queen Streetcar passes the Drake Hotel (on Gladstone)? Had my bag. Call it a social experiment, but nonetheless, some TTC employees can’t seem to contain their bias towards the right. Should I apologize for withholding this fact? Up to you to decide. For the record, the “bloated Union contracts” does not reflect my view of the TTC union but those who voted for Mayor Ford for a reason. Frankly, I don’t care much about what the TTC union gets paid as I do agree that they do deserve some form of a decent wage. Garbagemen, however are a different story (and usually the target of my wrath when I mention how much I get paid compared to them). I suggest that you email Sue-Ann Levy about your views on how much TTC workers should be paid, she has a pile of vitriol about the TTC herself (in fact it is one of her biggest pet peeves). I’m interested in what she has to say too, although I find her a bit too far right for my views on occasion. This is the situation we have in Australian cities and it is awful! Our train only comes every 30 minutes off peak. If something goes wrong, we have 30-45 minute delay PLUS add the normal travel time on that. Just be careful with the cuts. A cut loses riders, and then another cut becomes justified on grounds of “low patronage” and then another cut and another… and it all goes downhill. I have read some tenuous arguments from Stephen Cheung on this site, but the howler that he recently posted about his Reform Party bag (I say Reform Party because Peter McKay sadly sold out the Conservatives and the Reform Party stole their name) was an absolute howler. I did, to use that horrid “chat room” expression LOL. TTC Operators are busy people and they do not have time to analyse a bag to decide if they need to be rude. As my Progressive Conservative father used to point out, the NDP does not have the ability to deliver the vote of the “membership” of any union, despite the sometimes endorsement of the “leadership”. I suspect a large number of TTC Operators voted for Stephen Harper for a lot of reasons, just like millions of ordinary Canadians. I don’t know anything about Stephen’s experience with TTC Operators. It would be mere speculation to make any suggestions. What I do know – for an absolute fact – is that I ride the TTC many times a month. The vast majority of the time – essentially all the time – I receive professional courteous service. (I can’t remember the last rude Operator) I always say Thank You when I get off and virtually always receive a very courteous reply. Generalisations that suggest that TTC Operators are lacking in courtesy and professionalism are just not on. Whenever anybody during the election brought up that Rob Ford heard them out, I was waiting for the next thing that should have happened in that conversation – something got changed. But, that never happened in those conversations. It was always about how Rob listened, but never about him actually doing something. So how is listening to customers through a predetermined scripted setting that focuses the discussion on how to serve people better given an already decided outcome all that different from the supposed sins of the last mayoral regime and their inability to listen to people who didn’t agree with them? The routes are, with a couple of spectacular exceptions, going to be cut. The TTC and management and the commissioners are holding public meetings, well actually public open houses, where alternative routes for people are being presented. Comments are put into a box afterwards – they are not being asked for or solicited during meetings. How is this listening to people? I’m not seeing all that much different customer service wise with this regime. Rob Ford isn’t listening – he’s not even hearing. His regime is in the room which any regime will do just making sure the optics look good. But ultimately, Rob Ford’s vaunted customer service approach is no better then David Miller’s. Although the TTC staff carried clipboards, ostensibly to write down customer comments and concerns, they would only do that when prompted by the concerned customers. Otherwise, they would talk about having to find $7 million in savings. To be fair, the Commissioners should have been there, explaining why we needed to find the $7 million rather than lower-level TTC staff. And Rob Ford could explain why it was better to have a fare freeze and service cuts instead of a fare increase and service maintained/improved. To some extent, staff are carrying the can for the political decisions, which they were not in on. That being said, I found the claims that the proposed cuts had been carefully worked out to be unconvincing to say the least. Basically, you were expected to hear “we worked them out carefully” and nod in agreement. There was no backup evidence to these claims that the TTC staff could supply. Whatever happened to that revised Transit City plan that Ford said the TTC would have ready by the end of the month? Cutting bus routes and holding public consultations on that seem to be an effective tactic of diverting attention away from the fact that Transit City just got scrapped (except for Eglinton) and that no new plan will replace it. Steve: It was to come in early February, now late February, and I’ve even heard March as a possibility. My big Question is: Does the TTC have enough vehicles to put the drivers who are going to be freed up by the late evening cuts to work in the peak rush hours? Adding service in the off peak does not require any more vehicles therefore no capital cost. Adding service in the rush hour requires extra vehicle and capital costs increase. Is this explained anywhere in the TTC’s documents or is the fact that most of the track jobs are finished mean that there will be extra buses available for rush hour service or are they going to rebuild the fish bowls again? It is interesting to see that some of the US cities are now writing buses off after 7 years of use. I learned this from talking to a Milwaukee Transit maintenance supervisor. He could not believe that Toronto still had fishbowls. Steve: The TTC has some new buses coming in the fall. The current schedule for reconstruction on Queen’s Quay is also in the fall, but this is a comparatively small part of the system. Milwaukee and other US systems can turn over buses every 7 years because subsidy programs will fund these purchases. It is a make work subsidy for the bus builders, and also avoids the cost for smaller systems of having the capability of doing rebuilds. In Ontario, funding for new buses has been cut back. Tonight, I attended the NY Centre meeting on the bus route cuts. I wanted to know from TTC staff when the 15 rider/bus-hour was established. TTC staff wanted to give the standard answer as how the cut resources would be reused rather than answering my specific question. I was speaking to a rep named “Scott” (as per name tag). I did some probing to get the answer. I asked: Was the 15 riders/bus-hour cutoff in effect during the Miller era? Answer: No because the TTC was increasing service during the Miller era. Question: So why apply a 15 riders/bus-hour now? Answer: Funding can come from more subsidy, raising fares or reallocating resources. Extra subsidy and higher fares were ruled out. Question: Was that a political decision? Question: When did the TTC establish the 15 riders/bus-hour cutoff? Answer: In November or December (2010) during the planning process. Question: So Ford squeezed TTC funding forcing the TTC to come up with the 15 riders/bus-hour cutoff? Answer: If you like to say that. The questions and answers are recalled from memory so the wording is approximate. Steve: And that new standard was never brought to a public Commission meeting, nor were the effects of this value, or various alternatives, ever discussed publicly. This is an example of the TTC working behind everyone’s back and then getting upset when the public complains about the lack of consultation. As far as I can tell “normal accountable public [TTC] meetings” is an urban myth. Not that that’s much different than any other level of bureaucracy. Maybe Steve will volunteer to take you up on your proposal. He’d be an impressive sight in roller derby gear. Elbow pads and helmets for a TTC meeting – now there’s an interesting idea. Steve: I am not sure my knees are up for it! As for TTC meetings, there was under the Miller regime some degree of accountability, although even Giambrone let staff get away with some howlers of “explanations” when he should have called them to account. This is a common problem with TTC Chairs — they become infected with the need to make the organization look good. Has anyone suggested a tunnel under Lakeshore, proceeding north on Woodfield and connecting to the existing Connaught facility trackage on Eastern Avenue in order to reach Queen Street? Sorry if I missed it. Steve: Not under Woodfield, but on it. That of course is a non-starter due to the Post Office’s loading zone. Under Woodfield would be difficult because of the amount of space needed to get down below the elevation of Lake Shore and then back up again.